I thought you would appreciate this, Beth Ann. Love the color teal, huh? These do leave you wondering what the story is that is for sure. Commuting two hours a day affords me many opportunities to spot these personalized plates and ponder the specifics behind them. Just this a.m. on my way to work I spotted PIZZAS. Makes the commute more interesting, huh? I think as photographers we tend to notice the details perhaps more than others. Indeed. The more bizarre the better. Sometime even the most plain things become extraordinarily interesting in the right light too. Sometimes these vanity plates do stump a person. I love the plates on Mustangs – usually something to do with pony power – ha! Now I’ll pay closer attention to Mustang plates. Thanks for the tip. I agree about the hope that the plate isn’t also the driver’s state of mind at the time! One of my friends had a plate for a long time that said RNFNLY. She’s a nurse. She got the plate after her graduation. Love your friend’s plate. Good for her to celebrate a life goal reached in this way. My neighbor and I had a good laugh once when we saw a vanity plate that said “CARIES”. I assume a woman named Carie owned it. What she probably doesn’t know, though, is that CARIES means CAVITIES (the ones on your teeth) in Spanish. Thanks for your thoughtful insight, Ted. I nap occasionally, but only when exhausted. Now my husband, he can fall asleep anytime. I am wondering if you are the Ted Aaberg I remember from BLC. You can reply via email, which you will find on my “About” page, or respond here. I’m curious. “Vanity” plates certainly are thought provoking in some cases!!!! Some great suggestions thus far!!!!!! I once saw GR8NBED on an old Camaro Rally Sport. It was hilarious. Well it’s certainly something to ponder, I’d bet this person is a cat lover… or not, I dont know??? Yeah, hard to know for sure. I’ve never sprung for a personalized plate but I’ve wanted to! So…what would be on your plate? Ha! I have changed my mind over the years. I need to think about that! We always look at license plates, too. 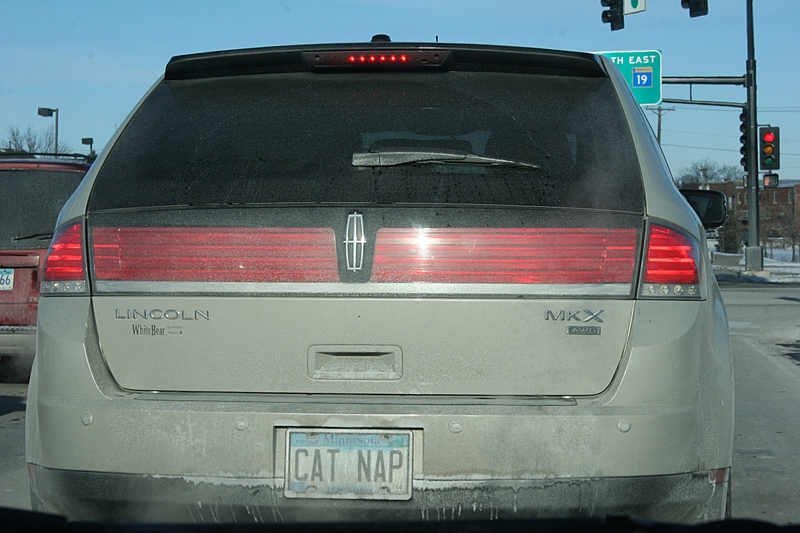 I hope this person doesn’t use their vehicle for catnaps! “Mud fur and feathers” mentioned that here in the comments, too.